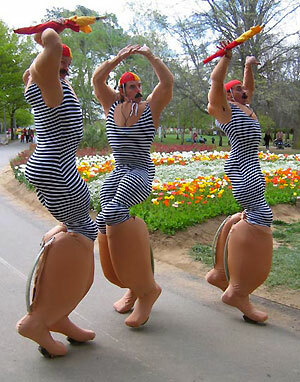 A delightful duo or trio of roving Life Savers with attitude mounted on bouncy stilts to make them even more attention grabbing. Fabulous for outdoor events, for meet and greet characters, beach or Australiana themed events, festivals as a roaming or roving walkabout act and many other corporate or private parties, functions and events. Sharks beware! These Bronzed hero's of surf and sand are on patrol and eager to prove they're ready to rescue. Marvel at their mouth to mouth! Be dazzled by their daring drills! Heroic? Certainly. Posers? Definitely. 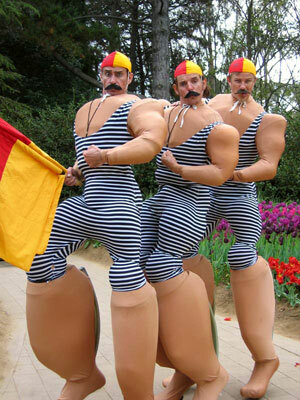 You'll need CPR after these moustachioed musclemen have bared their biceps while diverting danger. Swim outside the flags at your own peril. The act involves 2 x 45min sets in which they march through areas in search of a beach. At different places through the course of their journey, they display their muscle building poses - the Arny, Forward Thrust and the Buns of Steel. At times these poses are taught to the public. Flags are set, popular swimming styles such as the Australian Crawl, Dog paddle and Butterfly are practiced with the audience and members of the audience are rescued and Mouth to Mouth administered after an argument over whose turn it might be. Show spots are usually finished with a chaotic shark alarm.